Opal Sunn are Hiroaki Oba and Al Kassian, two expats from Japan. Al arrived in Berlin 2013 after studying in London. He also makes music as a solo artist and has released on Love On The Rocks and Utopia Records. Hiroaki is a 2010 RBMA alumni and divides his time between the German captial and Tokio. After releasing two eps on their own Planet Sundae label, they're offering their follow up on Nick Höppner's new label. Here they continue to refine their style which displays and exquisite sense of space , melody, movement and groove. 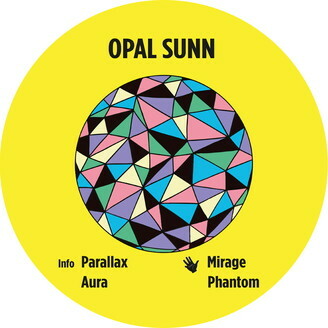 Opal Sunn's music straddles the line of body music and stimulation of the mind always bringing this contrast to fruition with their tracks. At the heart of the energetic opener „Parallax“ lies an arpeggiated synth sequence that constantly shifts shapes and bounces off the syncopated percussion and beat marrying the technical with the organic. „Aura“ rides an equally undeniable groove, but turns its misty-eyed gaze inwards, focussing on creating that oceanic feeling powered by emotive strings and textures. Over on the flip side „Mirage“ folds into the haze of a sweaty dancefloor hitting the sweet spot of minimalism, melodic content and physical propulsion. „Phantom“, the final track, drops the 4/4 in favour of an Electro beat occasionally kissed by the legendary „Think“ break. The vibe is decidedly deep and mellow rounding off an EP which oozes understated confidence and longevity.